Last night, on Jan. 29, six journalists, photographers and activists have been detained by Uzbek police and taken to an unknown location in Tashkent, the capital of Uzbekistan. Their names are Umida Akhmedova, Timur Karpov, Alexei Ulko, Ashot Danielyan, Ilgar Gasymov and Gulsum Osmanova. Her son Timur Karpov is a journalist and photo editor of the online Lenta.ru publication, he lives and works in Moscow and came to Tashkent for a short vacation. Several days ago authorities ordered removal of his photographs from an exhibition in the Tashkent House of Photography. His wive and five-month-old son await him in Moscow. Ashot Danielyan is the leader of the Origami Wings, a well-known rock band from Tashkent. All the detained are our fiends and colleagues, participants of a rally held on Jan. 27 in Tashkent in support of the Euromaidan, an ongoing series of street protests in Ukraine. On that day, they held a brief protest near the Ukrainian embassy building and submitted a petition in support of the Euromaidan in which they urged the government of Prime Minister Azarov to step down (which, in fact, happened in a day). They expressed their support to the people of Ukraine that “rallied against the inhuman, corrupt and totalitarian regime of President Viktor Yanykovych,” according to their petition. They condemned the use of force to the protesters in the Ukrainian capital, Kiev, and other Ukrainian cities and the reluctance of Ukrainian authorities to start a constructive dialogue with political opposition and the public movement at the Maidan. The photo attached to this message depicts the rally at the Ukrainian embassy in Tashkent. The last person to the left is Alexei Ulko, the rally's organizer, a journalist, culture historian and ethnic Ukrainian who lives in the central Uzbek city of Samarkand. In Uzbekistan, any unauthorized public events such as rallies, pickets and marches entail a strict punishment in the form of administrative arrest, a sizable fine or even a jail term. On the other hand, an authorization of a public event is nearly impossible. Obviously, the six have been detained for their irreverent civil activism and participation in the rally. The whereabouts of the detained remain unknown. Umida Akhmedova's daughter was told last night by police officers of the Khamza district that her mother and brother have been released. There is no information about the whereabouts of the other participants of the rally. No information about whether they have been allowed to have an attorney. Oleg Karpov, Umida Akhmedova's husband and Timir Karpov's father who has been trying to get in tough with them fears that they will be persecuted. I am urging all my friends and colleagues to support Umida, Timur and their friends. The police regime in Uzbekistan is very scared of an international outcry and criticism of its crimes and human rights abuses. 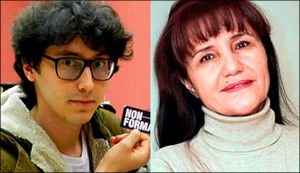 An international campaign to support Akmedova and the five activists has already begun. Today is Uzbek President Islam Karimov's birthday. He turned 76 and for the past 23 years he has been at the helm of the Uzbek state – just like many other well-known dictators who have been dethroned only by popular revolts. Let's “congratulate” the Uzbek leader by urging him and his intelligence services to immediately release the detained and to respect the fundamental human rights to collect and spread information and participate in peaceful rallies and gatherings!